I am a lifelong resident of Canandaigua. My wife, Shelia, and I reside on Spencer Lane. We have three grown children – Jennifer, Frank, and Nicole – and seven grandchildren. Before retiring, I was a building contractor in my family-based business and the Director of Facilities & Operations for the Canandaigua City School District. 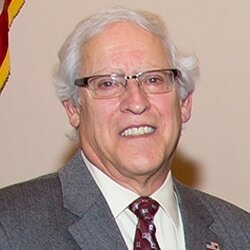 Current chair of the Environmental committee, and member of the Ordinance committee, I've proudly served as Canandaigua’s Ward 1 City Council representative from 1988 to 2000 and again from 2014 to the present. Notable accomplishments during my tenure include supporting the construction of the City Fire Department Building, restoration of and addition to City Hall, redevelopment of Lake Shore Drive and Kershaw Park, and site approval for the current construction taking place to enhance our beautiful community.